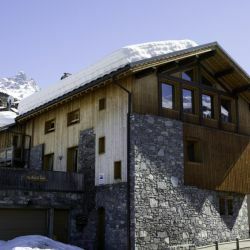 Chalet Marielle is a perfect chalet for taking over with a group of friends. 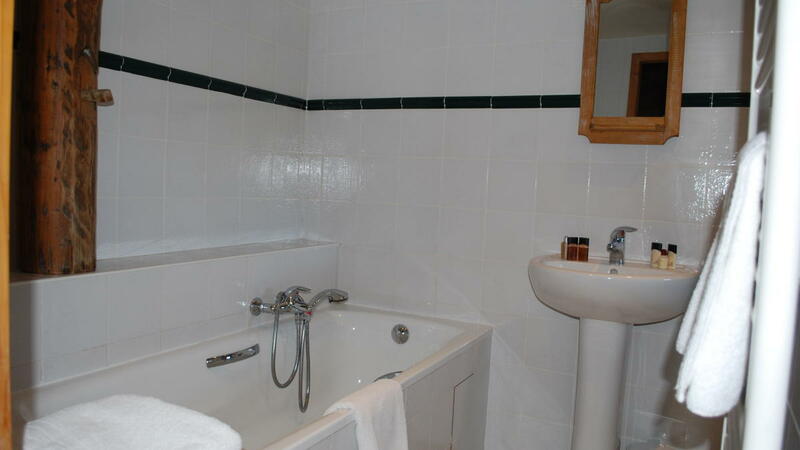 There is even the coveted single room which many people line up to book! 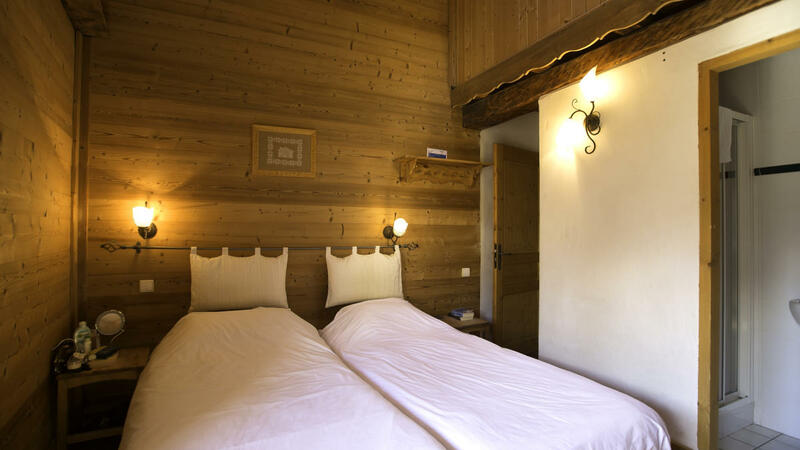 The chalet is full of character as it has been converted from an original Savoyarde barn. 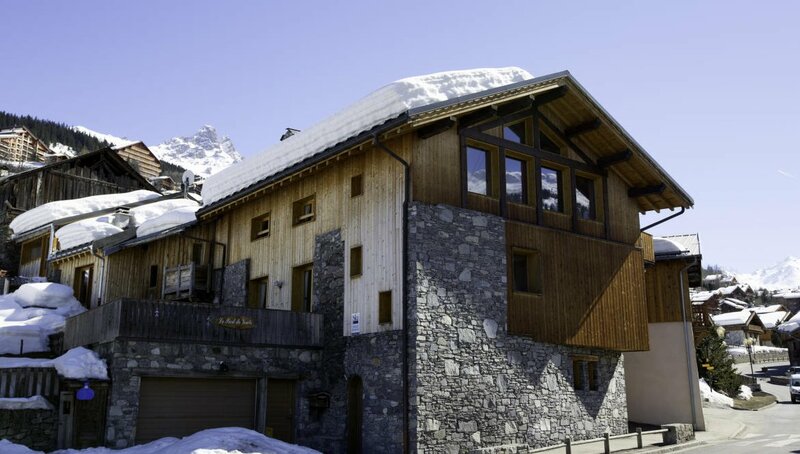 The result is a chalet with modern facilities and plenty of space over three floors to keep everyone happy. The open plan living/dining area has a beautiful and original vaulted ceiling which they managed to keep whilst renovating the property. 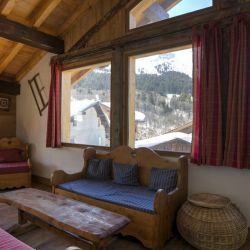 The result is plenty of seating and a lovely large open fire which creates the perfect chalet atmosphere for relaxing in at the end of the day. There is a second lounge on the top floor that has a balcony. 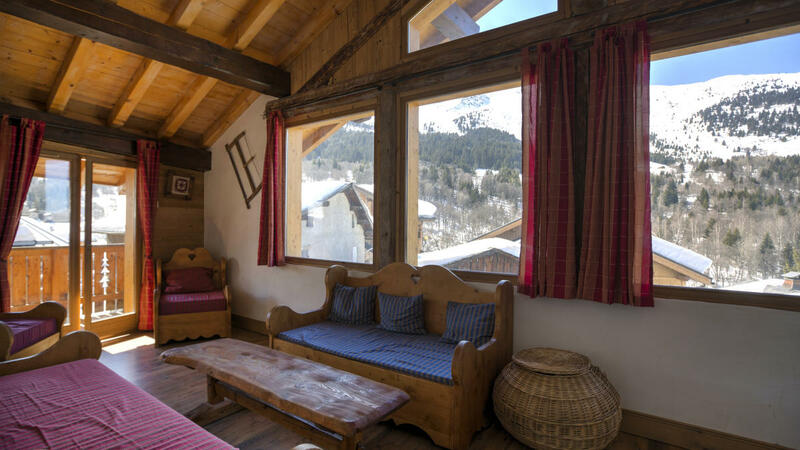 This is a perfect retreat for taking in the stunning views of Saulire and Mont Vallon across the valley. 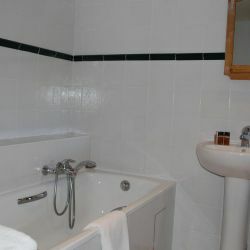 There are 6 twin rooms, 1 double and 1 single that are all a good size and have fabulous ensuite facilities. There are boot warmers and free Wifi access. Chalet Marielle can not take infants. 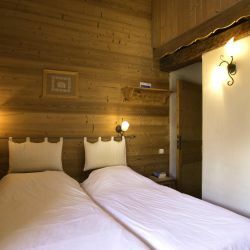 Chalet Marielle is located in the centre of the old village of Mussillon in Meribel. This is just 10 minutes from the resort centre and close to O’Sullivans for après ski. 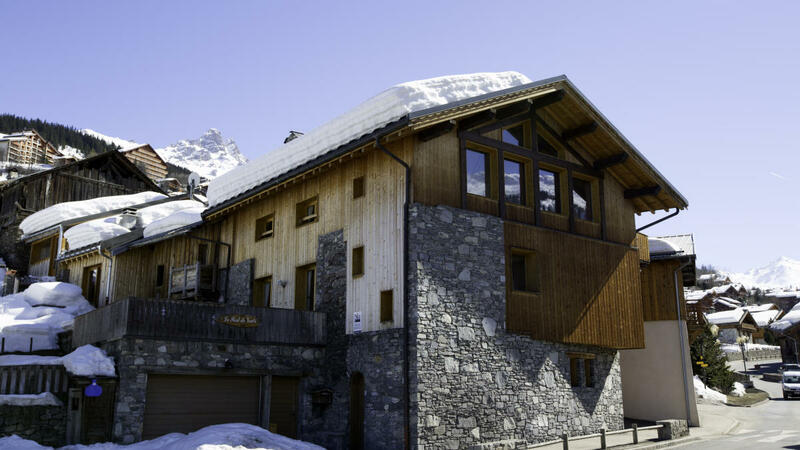 There is a chalet minibus service to and from the lifts at set times in the mornings and afternoons. Priority is of course given to ski school in the morning and it will run for the last hour before the lifts close in the afternoons. Breakfast every day will consist of a selection of cereals, porridge or muesli with yogurts, fresh French bread with butter and preserves. In addition we offer boiled eggs to guests not wanting the cooked breakfast of bacon and fried eggs with Heinz beans or hash browns and mushrooms or tomatoes which is served every day apart from Saturday and the chalet hosts day off (normally Wednesday) when we serve freshly baked croissants and pain au chocolat. To drink we have fruit juice, French coffee and a selection of breakfast teas. For afternoon tea (every day including the chalet hosts day off), the most informal meal of the day, help yourself to fresh bread, butter and jams, biscuits and home made cake or scones, either eaten at the table or relaxing beside the fire. The evening meal is served at 8pm. See below for details about children's dinner. To complement your meal we serve free and unlimited good quality Red and White wines during the course of dinner. After dinner fresh ground coffee or decaffeinated coffee as well as tea are served in the lounge. 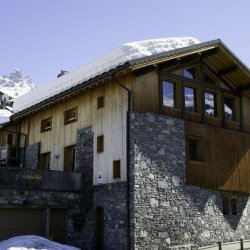 Additionally, the chalet operator has teamed up with its wine supplier Vin Chez Leon to offer a wine delivery service giving you a greater selection of wine while on holiday. If you would like to order additional wine you can do so direct with Vin Chez Leon (Minimum order 6 bottles & orders must be placed at least 2 weeks prior to arrival. Free delivery to your chalet. No discount is given if you do not drink the chalet wine). 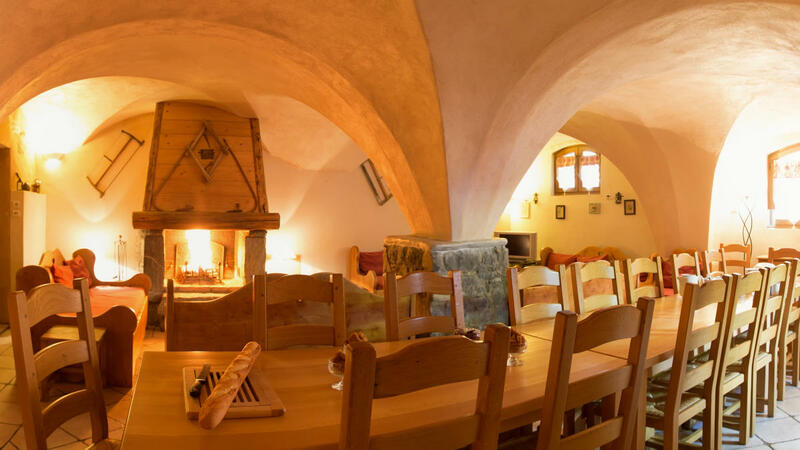 Our chalet hosts are used to adapting the menu to accomodate your food preferences. If you do have a specific dietary need (eg Vegetarian or Coeliac) or an allergy, please let the office know at least 10 days prior to your holiday start date. Many food preferences can be dealt with on arrival. Please note that French alpine supermarkets do not have the same range as British supermarkets, therefore if you have very strict dietary needs it is helpful if you can bring a few items. We would be delighted to help with the celebrations for any special occasion. Birthdays and anniversaries can be made even more memorable with a special cake - please just speak to your chalet host about this on arrival. 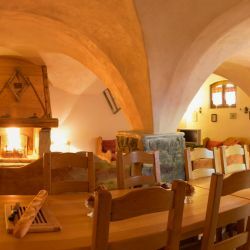 An alpine chalet is a wonderful place to spend the festive season. We provide Christmas trees and decorations. On the day itself, you can look forward to aperitifs, turkey with all the trimmings, flaming Christmas pudding, mince pies, and of course Christmas crackers. For New Year most of our resorts will have torch lit descents, fireworks and other celebrations. Alternatively, you could just enjoy New Year's Eve dinner in your chalet with a glass or two of fizz. Several years ago we introduced menu guides within our chalets, allowing the chalet hosts to choose from a selection of suggested recipes from the chalet operator’s own recipe book. This has proved to be very successful resulting in the vast majority of our guests classifying chalet meals as excellent in their holiday questionnaires. We believe this improvement was due to a good effort on behalf of our resort staff and the introduction of the Menu Plans.